Representatives from Sjogren Industries are putting the finishing touches on the presentation of superior product line at the International Wire and Cable Trade Fair in Dusseldorf, Germany from April 16 to April 20. Visit Sjogren Industries at Hall 11 Stand E50 to witness the fully-functioning wire-pulling machine and learn first-hand about the company’s growing legacy as an industry innovator. Come to the Sjogren Industries showcase to learn more about these revolutionary advances in the wire and cable industry. The Pivot Bar (PB) Series of wire straighteners maximizes efficiency with a design that minimizes space and set up time while eliminating the need for complicated and costly base plates for mounting. The PB Series comes with grooved rolls and precision ball bearings and available digital readout adjustment capability. S&H-TR Thumb Release Wedge Grip and the Vaughn Thumb Release Wedge Grip are designed by and only available from Sjogren. The TR feature eliminates the dangers of releasing the wire by allowing release on top of the grip so hands are not near wire and jaws on the release. These safety-inspired grips are fully compatible with Sleeper-Hartley style puller assemblies and Vaughn style puller assemblies which are common across the industry. Sjogren’s one-of-a-kind Preventative Maintenance program for straighteners and groove rolls is designed to keep your lines running and minimize downtime, all the while increasing productivity and profits. Sjogren has put together a recommended maintenance schedule based on the type, material, and usage of your particular rolls. Marker Groove Technology – Our innovative rolls are marked at the base to control the centerline. The Sjogren alignment marker accounts for variations in bearing width, and makes it easy for the operator to identify the correct way to mount replacement rollers to maintain tolerances. Controlling the centerline guarantees your wire doesn’t scratch or bend. All of these innovations will be on display in the Sjogren booth. The event will be held at the Dusseldorf Fairground featuring over 1300 exhibitors. 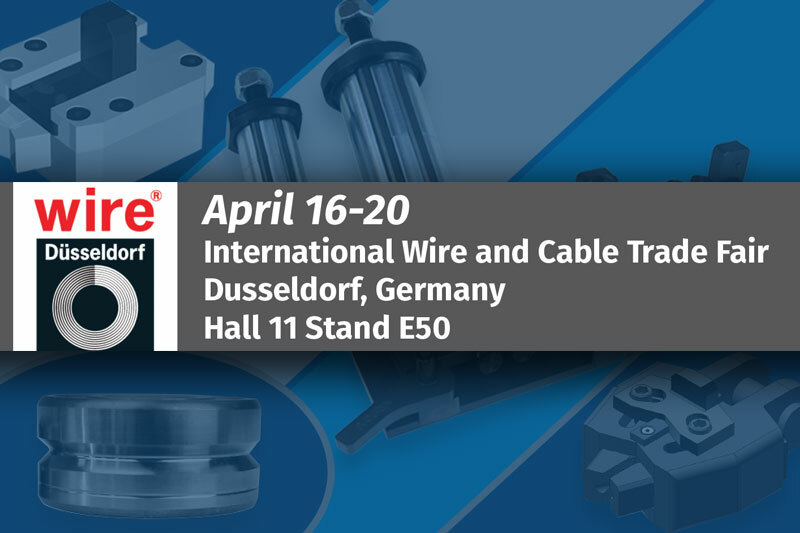 Be part of the most important trade fair for the wire and cable industry and learn about Sjogren’s 90-year history of ground-breaking advances in wire tooling machinery.